Thanks so much, sera! really appreciated! i just saw your gallery and it is great, so glad you like my painting! you are welcome! have a great weekend!! thanks so much, it is soo nice to have your feedback!! happy you like this one as well! it motivates me to draw more and more, thanks so much! i m so glad you also like this one! thanks! thanks umberto! so nice to have your feedback! have a great day! thanks a lot! i m very happy you like it, Sinsenor, you are great!!! merci! you have a beautiful gallery, glad you like my pics! Thanks so much, Biggs! really appreciated, your gallery is great!!! hi again! 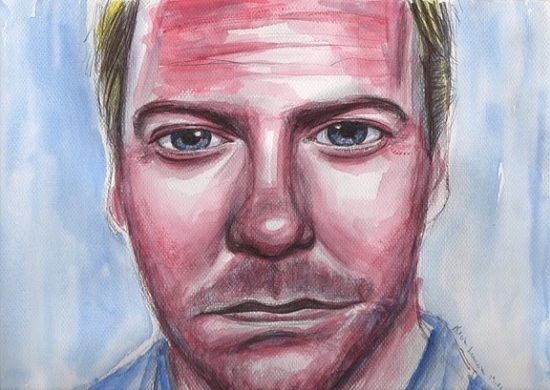 believe it or not, my next portrait will be again Kiefer Sutherland! I think he is a muse to me or something similar! have a great evening and let´s keep doing what we like the most!! Cool, wish i had a muse, i just like everybody! now you are talking, lets keep doing what we like most! You sure have my vote! Yes i have done a "series" of VIPs and their dogs... i will do some more later.... keep smiling, it will make people wonder what you have been up to! HI! nice to be back!! finally! the course is over. Do you have that VIPs&dogs serie on the internet?? and thanks, I´ll make my best to keep smiling! it is the best way to get through the day! Welcome back my friend! You must be so much wiser now! .. a huge Hadeda flew into my kitchen about an hour ago and i had to catch it before my dogs hunting instincts kicked in, luckily i have a way of calming both dogs and bird, when i let the bird out, (oh it felt so good holding it, its heart was beating so fast, i could sense it must have been so scared!) his mate was waiting in the trees, it was a fantastic feeling to see them fly off together! i googled "images of stars and their pets" but there are not very good photographs, just keep trying, if you need any more help, let me know, i can email you some photo's i have, i do not mind! Thanks! So nice to be back! It had to be great to see that bird so close! I can see you have a special gift for animals! Some months ago, I had the chance to almost touch a little fox! I was in a refuge in the mountains and the fox was so used to people that came to use asking for food! For the images of the animals, thanks a lot but at the moment I must focus in the next project (it is so easy for me to try to do several things at the same time and then getting nothing done!). It will be about Flamenco, for the annual Flamenco festivities in Barcelona! Trying to get hold of the organizers to see if they are interested in my Flamenco pictures! But in the near future I´ll get back to the idea with the animals and get back to you on that! no problem, whenever you are ready! WOW i would love to see the flamenco festival! It must be AWSOME!!! Have you seen the movie, Mission Impossible with Tom Cruise, where he went to Spain? Only a short piece where they dance the Flamenco... if you listen to it with good speakers... ui, my heart starts beating just listening to it... I will hold thumbs, that your flamenco art will accepted! Don't give up, you can do it!!!! raining! do you get much rain there? i guess that is why is so beautiful! in barcelona it is raining more often than what i expected when i first moved here..but today we have beautiful sunshine...and in a clear day like this one we can see the sea from my workplace! WOW! That´s so cool! I thought i was used to the English weather alter all those years, but the truth is that when i came back i realised how much i had missed all this, and how much i needed the sunshine and the warmth! On the other hand, Spain is not so good for jobs, and the way of working is so unefficient!! Hard to adapt again to that! But just imagine the pleasure to be able to go to the beach every afternoon is you wish…(specially in the summer). Maybe you could come to visit sometime in the future! same here, rich people live by the sea...where did you go in Andalucia?? my favourite city is Granada!! i love it so much!! only 3 h by from my hometown, Murcia. La Alhambra, the 3,000 meters mountains, the free tapas!! i´ll try to visit me too soon!! Malaga is close to my hometown too...so beautiful...but SO HOT in the summer! well, it is possible! funny, eh? i love the heat, but sometimes too much even for me! unless i m on holiday by the sea! so how is the weather being there, you are not able to get some sunshine? i know what you mean about needing the sun...over the 6 years i stayed in England, I looked so pale during the summer because I didnt get enough sunshine...in contrast, during my childhood in South Spain I was always BROWN in the summer! so i didn´t recognizse myself with pale skin in the summer! i LOVED your photos so much!!!! Brought back a lot of memories of my own.... will tell more in my email! i m so glad you liked them! i also loved yours (i still haven´t had the chance to check email). it is so nice to finally see each other! lloking forward to see that email! my boss is back from China on Monday and i still have lots to do before i meet her! China.... saw a sad program on tv, an alley with lots of little cafe's... with Dog pictures above... they were serving dogs as food... the things they said.... it broke my heart! i know! i´d seen that kind of programs too, it is terrible! i hope that after the Olympics and all that they´ll make a real effort to fit in the civilised world!...everybody is going home now...it is only me here! i´ll check quickly my messages and leave too, it is scary! imagine i get trapped at work! (lucky i live only 30 min wlaking from here!) i´ll tell you tomorrow how it went! take care of yourself too! i loved your emails by the way, i´ll answer as soon as i meet my boss about last week´s work! i got trapped at work twice... i used to be a window dresser in Cape Town, (loved the work, always something new and exciting about fashion) and was busy in the window, the managers did not see me, i forgot about the time... suddenly the lights went out and all was quiet.... luckily they came past the window, so i banged at the glass and the other time, the alarm went off and they ran back to the shop! oh my godness! lucky that the alamed was conected! imagine otherwise! maybe we should have a little survival kit in case something like that happens today i have to walk on the road between abandoned cars, as the pavement was completely frozen! i hope the sun has melted it by now! i slipped once on ice... had a beautiful lilac/orange/yelow/purple hip! there was like a secret back entrance to the shop, where i could have slipped through, it would lead me 5 stories up to the Display Department... but on my way there, i would have to pass a room filled with mannequins... and all was in total darkness.... it is freaky and horribly scary... i did it a couple of times, but not because i was locked in, but because nobody else dared go past those mannequins... sometimes i think i am more stupid than clever! Oh my goodness! How scary! it sounds a bit like being inside of a horror movie! about the coloured hip, i understand the feeling! when i first learned snowboard, the snow was super icy and i ended up with all my hip-bottom black! although for this weekend the snow forecast is about 70 cm powder, so it will be quite soft! it felt like a horror movie.... cool breeze.... and then what really helped, there was a toilet closeby, nobody used, it would always flush suddenly and that made me jump! they would say, its "Peter's Ghost"! Peter was the Display Manager who passed away, when i started working there... he was a great interior decorator too... hope you have some real fun snowboarding.... just go easy on the raclette! how scary the story about "Peter's Ghost"! i m back!! at least for today, just managed to tidy all my work! i hope it last at least a few hours! Ola Alicitaaaaaaaaaaaaaaa My guests have left and i cannot go out, it is raining cat and dogs here, so i decided to check my emails! WOAAAAAAAAAAAAAAH so many!!! i am doing fine, will try and get through my mail and if it stops raining i have to go to gym and grocery shopping, big day... i still have washing i have to do... but i will be "world unfriendly" and pop them in the tumbler instead... no sunshine outside... Speak to you soooon! i forgot u had guest!!! how was it!? i hope it stops raining soon! don´t worry and take your time to catch up emails! lots of kisses and speak to you soon"!!!!!! packing tonight to go to New York on Saturday!!!! WOAH NEW YORK!!! Oh that sounds sooooo fantastic!!! Hope to visit the Big Apple too one day!!!! yes! Biggs at the Big apple! oh shoot, you are leaving mañana already!!! i thought on sunday, heck, you must be busy as hell right now!!! Well, happy packing beautiful, make me some beautiful photographs of you and all the famous places!!! But most importantly: E*N*J*O*Y!!!!!!!!!!! Bon voyage!!!! i thought so much about you over there!! you would have loved it! and so many art galleries! i m thinking to do a collage with of the leaflets, etc, i got, to make it look like the view of Manhattan from the brooklyn bridge! Oh my heart just skipped a beat!! i cannot wait to see the Big Apple myself one day!!!! then i will think of you again! your idea of a collage sounds so AWSOME!!!!! You are so creative! WOW! brilliant! When i walk into a store something has to "talk" to me... i will straight at it and if i dream about it, i know i must go back and get it.... luckily this happens seldom, otherwise i'd be bancrupt soon! i know exactly what u mean, it happens the same to me!!! the problem is that sometimes i just decide to buy too many things at the same time!! but if all those things are about art, then it is OK! thanx for letting me feel so much better! thanks Sofya! I really like your style too, I think it is very personal, which is rare and great! let´s keep up great work! have a great weekend! you too! it is Monday but let´s try to make it a great Monday! Thanks!! I m glad you like it! I have just been in your gallery and it is beautiful, well done! have a great day! thanks chantal! your portraits are great, your opinion is very value for me!